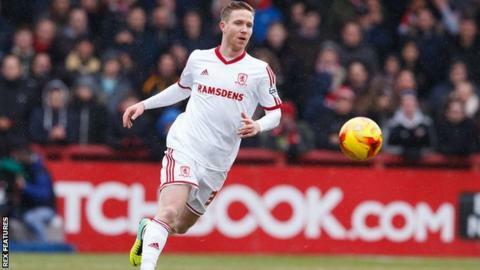 Middlesbrough midfielder Adam Forshaw has admitted his career at the club "hasn't been the best" so far. Forshaw has started only nine games in all competitions since joining the Teessiders from Wigan in January. The 24-year-old recently returned to action after missing more than a month with an ankle injury picked up in October's Championship loss to Cardiff. "I'm fit and raring to go and hopefully I can get in the team and help out," he told BBC Tees. "My Middlesbrough career hasn't been the best on the pitch. I haven't really had many injuries except for the few weeks I was out. "I've had to bide my time and try to be patient, and I just want to play more games. "Everything about the club is set to go to the Premier League and I want to be as much a part of that as I can."